There’s a sort of intentional remix going on here, after all. I don’t actually have the ability to speak Japanese. Even if I did understand Japanese I wouldn’t really understand Japanese the way I do English. I wouldn’t be good at recognising inflections and tone and timing and where you should put the weight on a word to change its impact in a moment. The point is that in any time I’m watching this show, I am always going to be perceiving it through a veil, which preserves me from some of it. I don’t know how cringey it is to hear Phillip and Shotaro sing along to a pop song on the radio, or how well-delivered Ryu’s lines are. It’s easy to forget these things, that many of the things we elevate are still ultimately shows for kids. Evangelion is a great show but it wasn’t designed to be a numinous artwork for forty year olds to unpick like a metaphor quilt. It was designed to fill a time slot and make more money than it cost to make, and everything else that flows from there is accidental. In pulp media it’s often much more of a basic checklist for the work being made. When there’s a high demand and comparatively low production costs, you’re often given the frame of a genre where you mostly have to include the things people expect, then the rest of the story is a bit more free-form. This likely isn’t quite the case with Kamen Rider W – it’s part of the Kamen Rider franchise, which is longstanding and well-regarded. 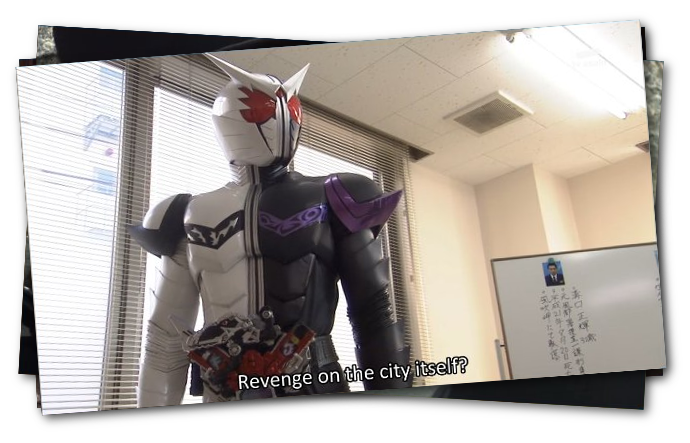 Part of what let the series do all the cool stuff it did was that the people making it had made another Kamen Rider series. Nonetheless, this means that for all I’m sitting here talking about how Kamen Rider W had this fascinating two-layered diegesis of hardboiled characters opposing hardboiled ideologies, it is still a show that’s for ten year olds to watch and hopefully encourage them to buy arcade toys, and keep watching until the next Sentai show comes on, too. With that in mind, there’s a lot of reason to not bother putting that much work into this show, right? You don’t have to make it good. You don’t have to give it good structure. You’re dealing with kids, and they might miss an episode or assume they missed an episode. You always have the failsafe of young memory to hide your errors or your lack of work. Yet, despite that, W goes for the harder route. It’s a show that, yes, in execution still features boys in bug suits who have to try and jump-kick T-rexes and PS2 era graphics, but they also bothered. It isn’t just that the show is well structured or it has a reference pool that isn’t just something the kids have heard of or that the plots are planted and payoff in a way that lasts more than one episode. It’s that within the context of the show itself, this show wants you to care about its characters, and it makes them seem cool. A lot of cool is pulling it off. It’s not so much that Kamen Rider W is cool, it’s that it knows how to set up moments to be cool. Fights aren’t just well choreographed, they’re well-paced. Some shows make a fight last N seconds, then something ends the fight. Even shows I like are prone to doing this. The fights don’t have flow to them, or have anything to show off – it’s just a block of delaying time. In Kamen Rider W there’s moments of ceremony, moments that would be stock footage in a lesser series, like each transformation, is instead made specific, made to be cooler. The sincerity of the show, coupled with the expertise of the people making it means that there’s some stuff that – let’s be real – is probably here for marketing purposes. Making it so that the Kamen Rider has twice as many toy drives, and is made up of two very marketable hot boys, and the cars and outfits and toys all come in two parts so you can customise them together, that was probably a decision made primarily to sell more toys. Yet when presented with ‘we need to make twice as many toys’ the show made use of that. 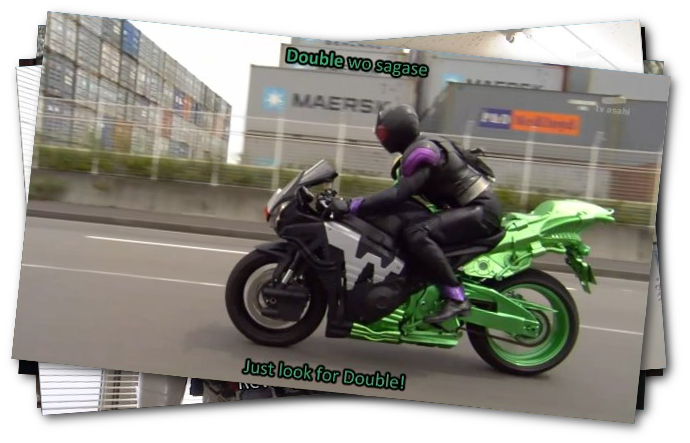 The line dividing Phillip and Shotaro’s rider look is used to do things with the camera that I just love. There are times when they show a conversation between the two by showing the rider from one side, then the other. This gets to represent a back-and-forth conversation easily. Sometimes they can frame a moment where a character is doing nothing to juxtapose with the other character doing something. There’s also this thing where they can show one side of the character working slowly and awkwardly because the characters are traumatised or confused. This could all just be quality, of course. It could just be that the people making this show cynically recognised that making the show well would sell more stuff. I’m not trying to make these people out to be artists or marketers and a big reason why is because I just don’t know. All I can do is read the outcome, and well, this show is way better at being what it is than similar stuff I’ve seen in the west. But then there’s this moment, first in the Fang arc, then in the Isaka arc, where we learn how the moves get named. They don’t come out of the box named. They get named when Phillip and Shotaro use them. It isn’t just that these things have cool-sounding names, it’s that these characters name them and they’re still cool. There’s this moment of I guess intense affect when you realise that Shotaro as a character cares deeply about doing good, but also, in what he’s doing, he wants to do it in a cool way. That’s a very human way to be, it’s a very sincere thing. I know when I was a kid and I played Power Rangers, the question ‘why do they gesture like that’ or ‘do the powers need them to announce them’ always came up, and it came up because it was cringey and dorky to do it. As we got older and older, that particular thing got worse and worse. Then you get to Kamen Rider W where they totally unironically name the devices. They call their attacks. When a new attack gets introduced, it’s made clear that these attacks get named. This is, ultimately, a series about watching dudes in bug suits punch monsters and occasionally, a woman gets to do something, or is threatened. This show isn’t great about giving women a lot to do, or things they can do that aren’t ultimately about being evil or victims. It’s not perfect by any means. And at the same time, it’s so much better than shows I’d naturally compare it to, and a big part of why is because this show cares about being this show.